After receiving a sweet bailout as a reward for royally mismanaging its finances, Citigroup is coming under fire from prominent politicos such as Dennis Kucinich, who says the US government should demand that the bank cancel its “Citi Field” sponsorship with the Mets. Hat tip to MetsToday reader “wohjr” for the link. An intriguing proposal, to say the least. On the one hand, Citi did enter into a contract with the Mets, and what’s the point of a contract if one side decides to, um, bail out? Further, doesn’t the company need to continue advertising and promoting their brand? For example, if the US bails out GM, does that mean they should stop doing TV commercials? Tough question. On the other hand, would Citigroup gain enough customers in the next 20 years to justify the $400M investment? Hard to say, as I’m not a marketing forecaster. From the perspective of the average joe, smattering your name across a baseball stadium when you’re broke doesn’t look so great. It could, in fact, be argued that Citigroup will LOSE customers as a result of continuing with their sponsorship. It doesn’t matter if Citi takes that $400M and spends it on a rash of TV commercials, magazine ads, and PR events — the guy on the street can’t SEE that money being spent. 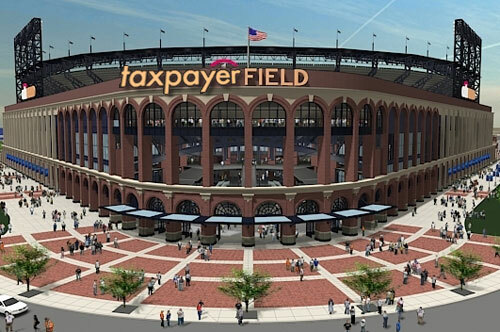 Naturally, there’s also the point that taxpayers have been partially funding the stadium’s construction … so why isn’t the taxpayer’s name on the front of the park? From the Mets fans’ perspective, it’s just as murky. Without Citi’s name on the stadium, the Mets have $20M less to work with every year — which more or less pays for Johan Santana’s contract. Since the team appears to already be penny-pinching, would such a loss in revenue result in payroll cuts? Would the team begin to operate even more like a small-market club? Of course, there’s also the possibility that they are able to get another, more lucrative sponsor for the stadium. Though, it’s hard to imagine someone stepping up with big bucks in this economic climate — unless the company is Google or Raytheon. Many have been speculating that the Mets disinterest in big names such as C.C. Sabathia and Manny Ramirez was due to the Bernie Madoff scandal. Perhaps. And, perhaps they are also bracing for the possible loss of Citi’s $400M commitment. You make a good point about the funding Joe… I had been assuming that some other sponsor would jump right on that, but perhaps not. The plus side of that, I suppose, would be that we could can the Domino’s-style uniform patch which I am definitely against. If they couldn’t get another corporate sponsor, why not give it for free to a charity or non-profit? Just imagine… Red Cross Field? ACLU Field? I’m sure they could find a way to tax-deduct the requisite change in branding/logos, right? Admittedly a little pie-in-the-sky but hey, we can dream, right? eephus, I LOVE that idea! it may be turned into a post this weekend, in fact …. back to photoshop …. It’s laughable, really, but at the end of the day, Fred Wilpon is a mad genius. The Mets will sell out for at least the first 3 months of the season.